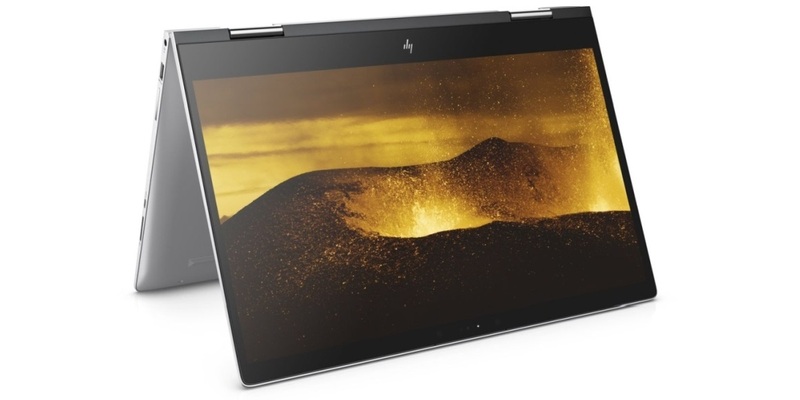 There is no need to introduce HP - they have been active in the field of portable devices for over 35 years now and their portfolio includes products of all price and performance classes. 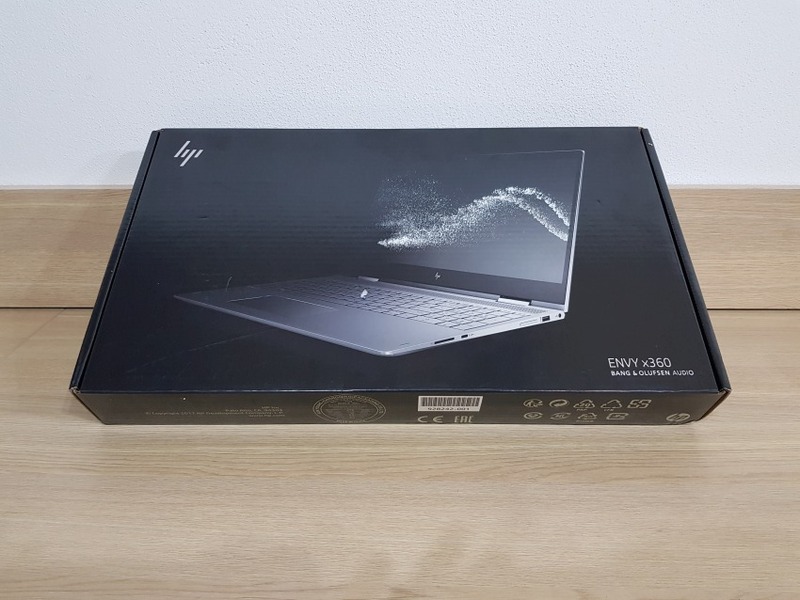 Today, we're going to review the attractive HP Envy 15 x360 laptop from the convertible class. This class features touchscreen devices with 360-degree swivel monitors or detachable keyboards. Other full-fledged representatives of this class are the Lenovo Yoga, the Dell Inspiron Touch, or the HP Spectre. The HP Envy 15 x360 is a 15.6" laptop that comes equipped with a swivel monitor. It is designed for students, office work and more, because the emphasis is placed on the device's low weight, slim profile, stylish design and durability. The device should also maintain powerful performance and provide an easily readable display and a full-size keyboard with a numeric pad. 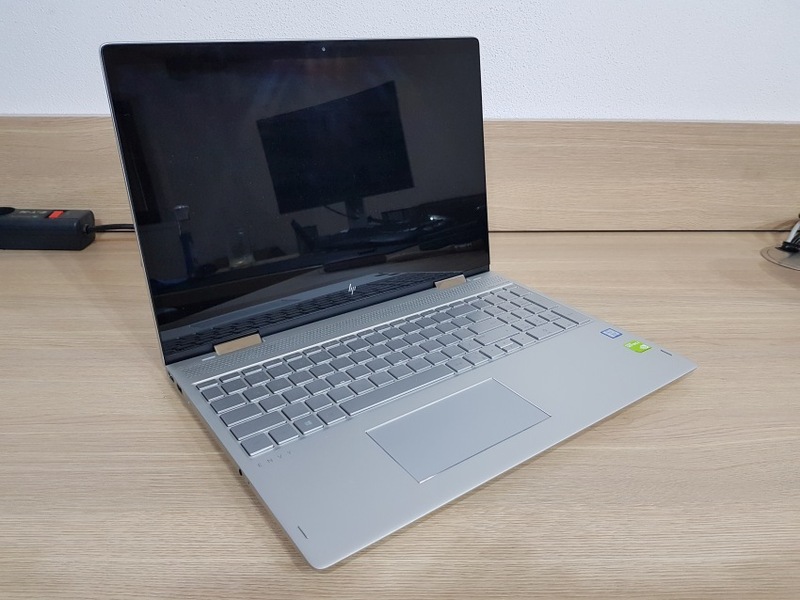 A representative user of this laptop is a student who appreciates the device's swivel design on their commute and who works with text and graphics software and enjoys watching films or gaming in their free time. 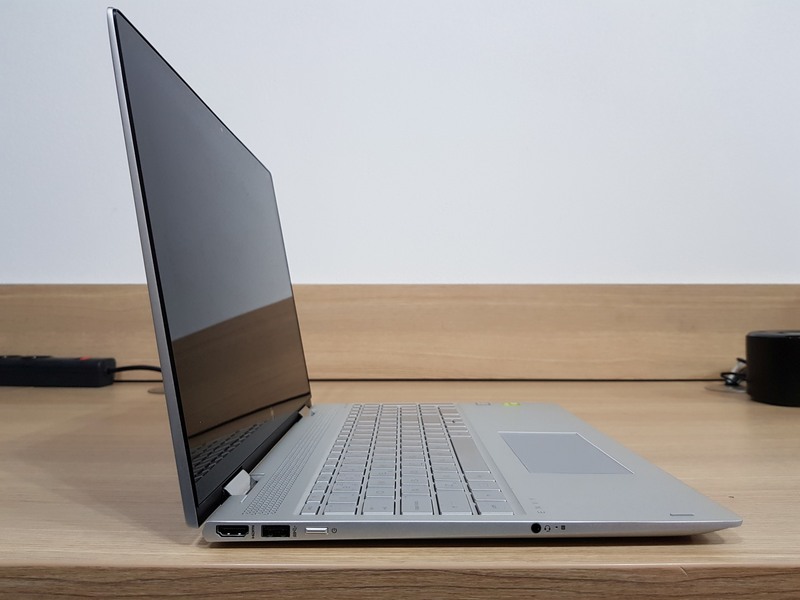 The tested piece boasts an IPS display, a dedicated NVIDIA GeForce MX150 graphics card, an M.2 SSD, a standard 2.5" HDD, a backlit keyboard with a numeric pad, an FHD webcam and Bang & Olufsen speakers. Let's see if HP did a good job in creating a reliable compact everyday companion with sufficient performance for both work and play. 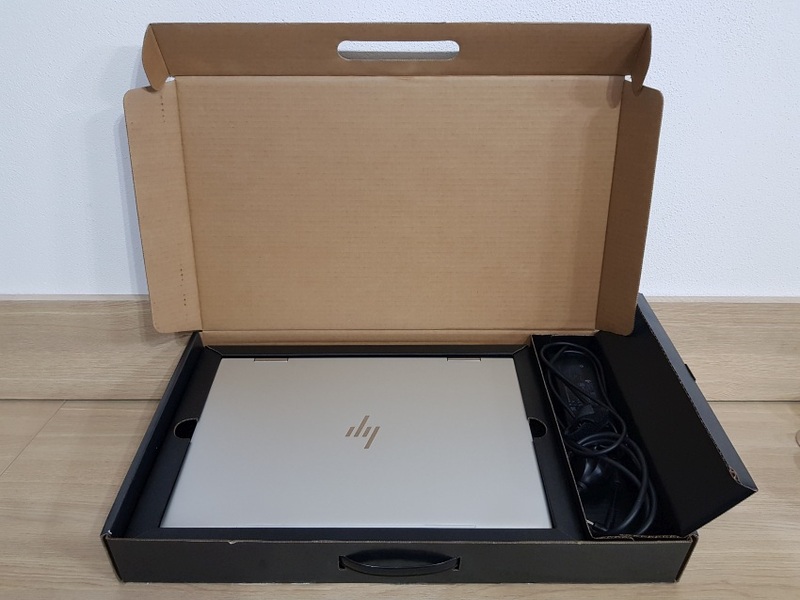 The HP Envy 15 x360 arrived in an attractive black cardboard box with a picture of the device on it. Besides the laptop itself, the package also included a standard size 90W power adapter. It features an L-shaped connector and both its cords seem high-quality and durable. The adapter is made by Chicony. After unboxing, the HP Envy 15 x360 shows itself in all its amazing glory. Its aluminium body boasts an elegant, luxurious look with a matte brushed metal finish, which gives the surface a coarse feel. Its first-class processing allows a clean design without any milling defects or other flaws. The bottom part with a keyboard and wrist rest is solid and robust, not giving in to high pressure and remaining intact even if you pick the device up with one hand. All its edges are smooth and specially shaped. The wrist rest is comfortable and doesn't make any creaking noise when you rest your hands against it. 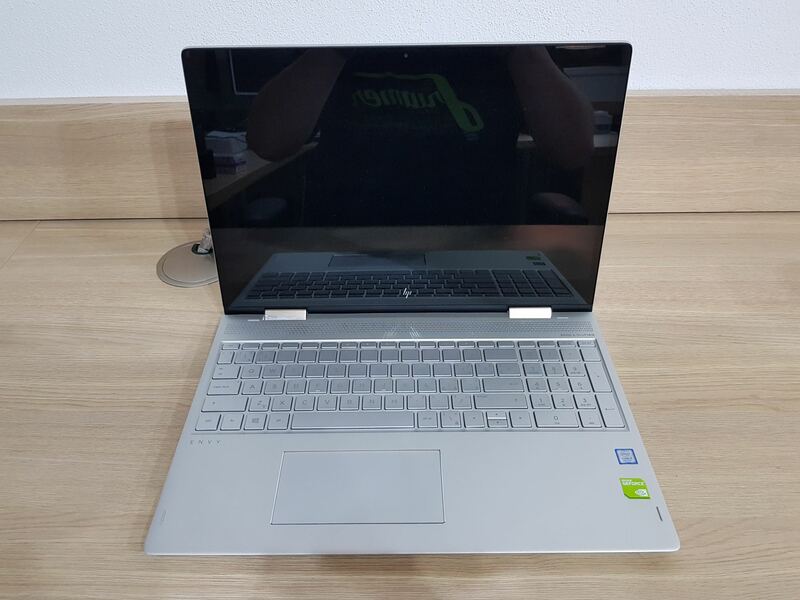 The HP Envy 15 x360's top part with the screen is made from an identical material and features the HP logo. The lid isn't loose; it holds firm and it bends only minimally. When closed, the lid is held in place by magnets, but it can be easily opened with one hand. It should be mentioned that the hinges are a bit too loose — if the lid is at more than 100° and the laptop is affected by vibrations or shakes, for example on the train, the lid may go down. This also happens if you hastily pick up the device when the lid is open. 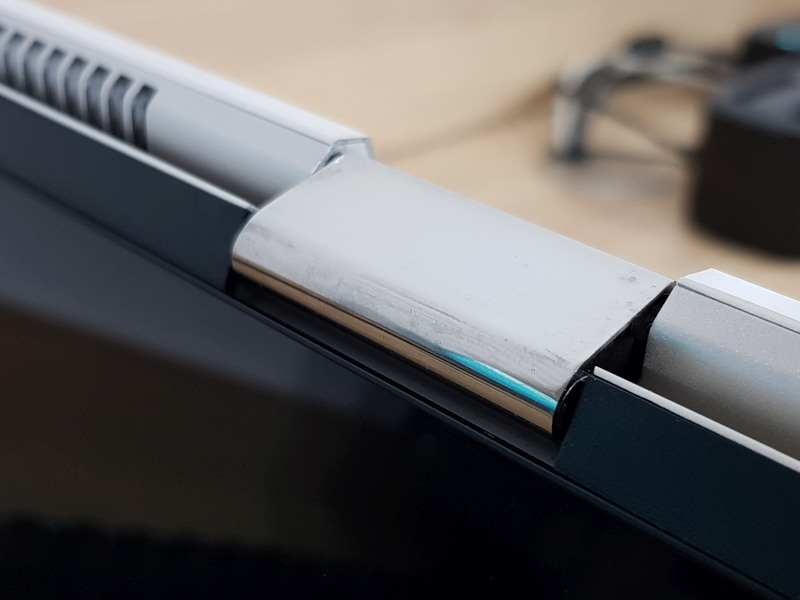 The only thing the hinges should be reproached for is their covers — unlike the rest of the laptop, the hinges are glossy, even though they are made from metal. It makes them look like they are made from cheap plastic. What we must appreciate is the HP Envy 15 x360's decorative speaker grille with an interesting triangular pattern that provides a modern look. 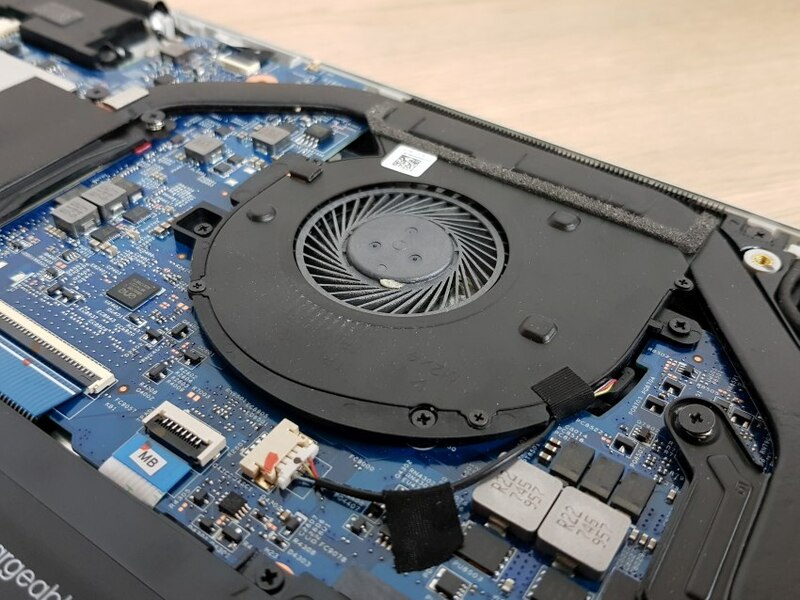 The rear part of the laptop is dominated by a robust vent — though only a half of it is active as the rest is sealed off by a dust filter and serves as an inlet vent. 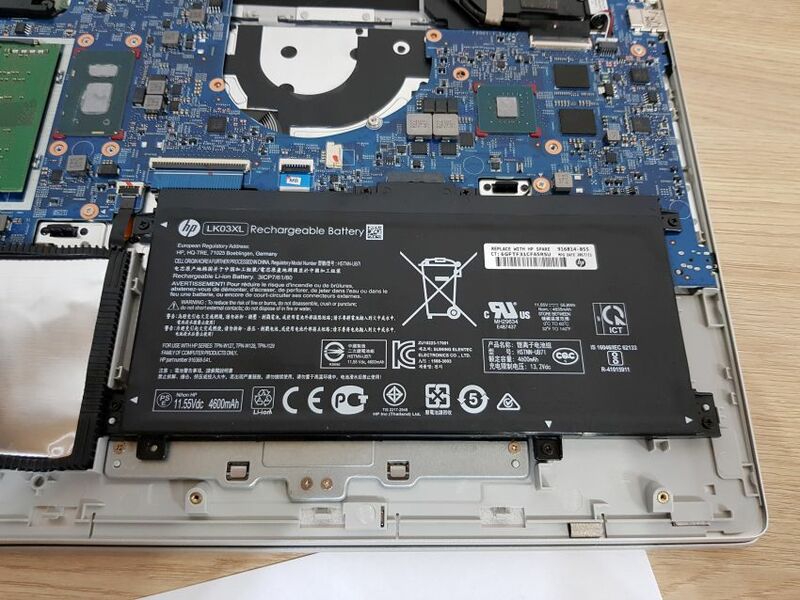 The HP Envy 15 x360 follows the current trend for slim laptops, which goes hand in hand with the removal of the connectors that are not used daily. 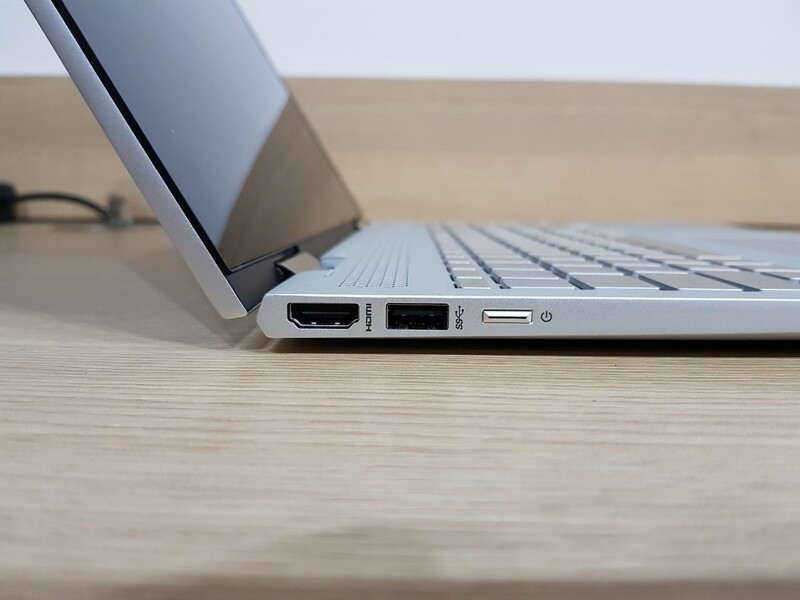 The laptop comes equipped with the essential connectors — a full-fledged HDMI 2.0 port and a USB 3.1 port on the left side, together with the power button that also serves as a LED status indicator. Closer to the user, there is a combined 3.5mm jack. The right side of the HP Envy 15 x360 features a charging port with a battery charge indicator and another USB 3.1 port — this time with HP Sleep and Charge technology that allows you to charge your portable devices even when the laptop is switched off. 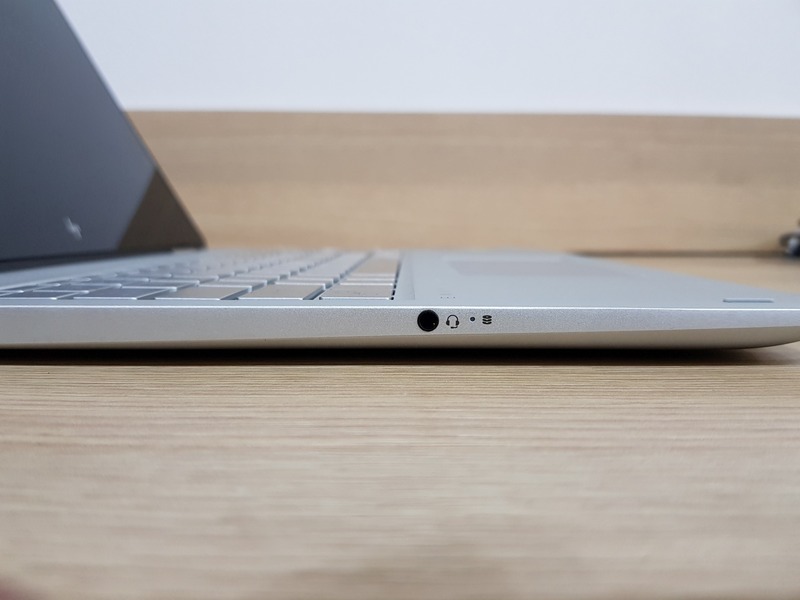 Moreover, there is a two-way volume control button, a USB-C 3.1 port with Sleep and Charge and a Realtek SD card reader. 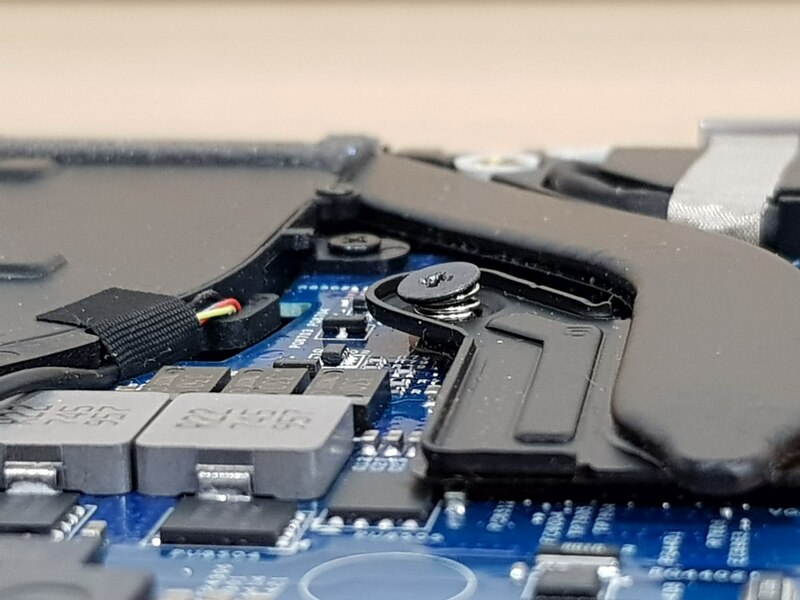 You won't find any connectors on the front or rear side of the laptop. Students living in the dorm may need to equip themselves with a USB to RJ45 adapter for a wired connection. For wireless communication, the HP Envy 15 x360 uses a WLAN Intel Dual Band Wireless-AC 7265 M.2 adapter. Its maximum data rate is 867Mbps. It operates in the 2.4GHz and 5GHz bands and also includes built-in Bluetooth 4.2. Its antenna configuration is 2×2. 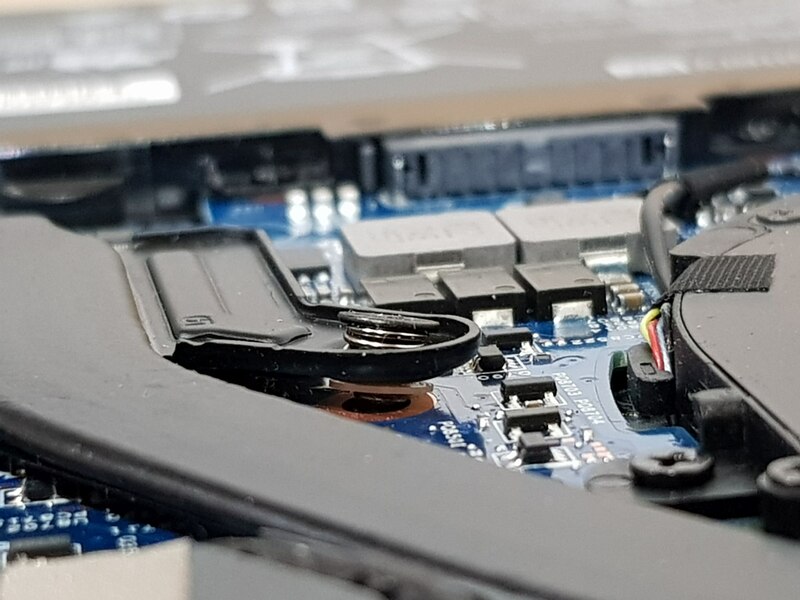 The device doesn't support the installation of a WWAN or GPS module — these are mostly found in workstation computers or business-class laptops that are twice the price, which is why we don't consider this a drawback. 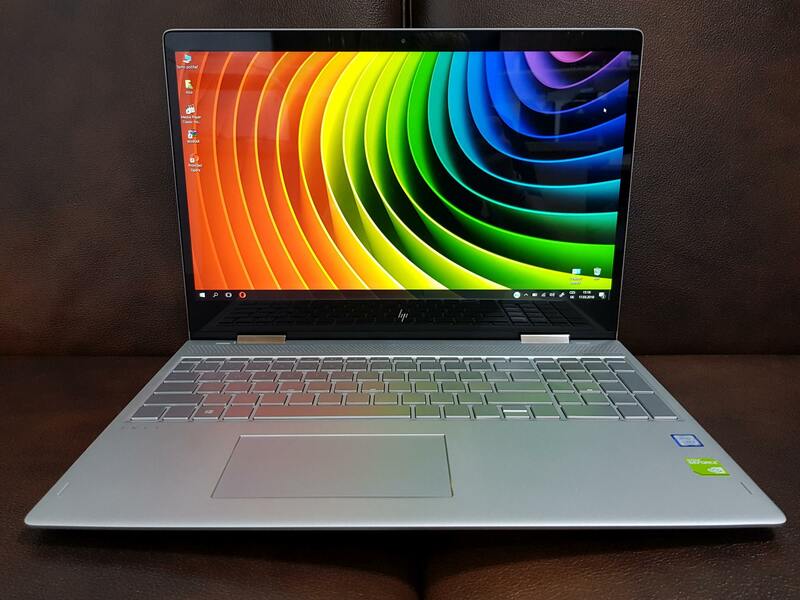 The HP Envy 15 x360 comes equipped with a multi-touch 15.6-inch IPS Full HD (1920×1080) LCD display from LG. 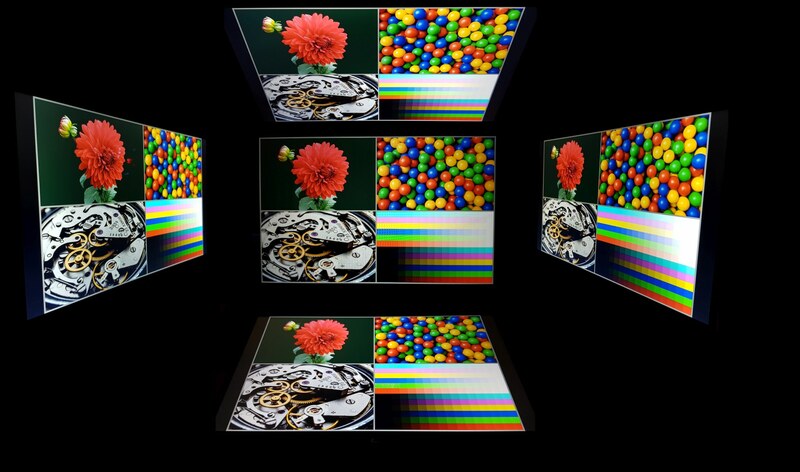 The display's colour performance is pleasant and balanced with a cool touch. Reds could be a bit more saturated, but considering the class of the laptop, we can say that its colour performance is satisfactory. The backlight is even and allows 11 intensity settings. The manufacturer has provided PWM brightness control, but a frequency of 1000Hz shouldn't cause eye strain or nausea. The HP Envy 15 x360's display is fine, comfortable to work with and doesn't require exact colour calibration. With IPS technology, its viewing angles are outstanding, allowing you to always enjoy a pleasant viewing experience. The touchscreen panel is well calibrated — it responds quickly and accurately, which makes its use very enjoyable. You may consider purchasing a special pen that is suitable for Windows Ink Workspace. The touchpad is quite large (120x60mm) and features built-in buttons without visual markings. The left side (approximately 8 square centimetres) is the left-click reaction area, while the remaining 4 square centimetres correspond with the right-click — which means that only the bottom right corner allows you to perform the right-click. The touchpad responds as accurately and smoothly as the screen. It isn't merely a functional substitution for a mouse; it is a full-fledged and comfortable control element, which was handled perfectly by the manufacturer. The manufacturer of the touchpad is Synaptics. 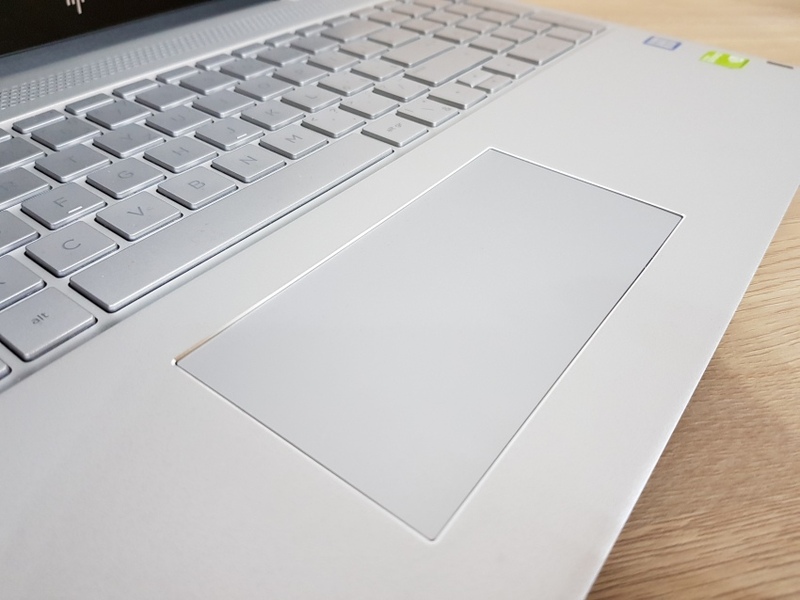 The HP Envy 15 x360's keyboard offers a standard layout that is typical of the latest HP laptops. 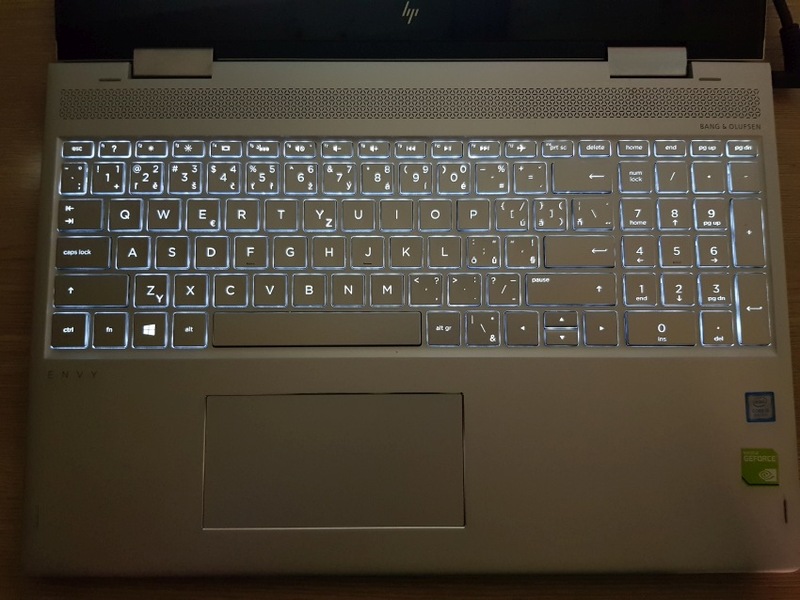 The price to pay for the keyboard backlight is worse readability in daylight while viewing the keyboard at an angle, because the transparent letters blend in with the surface. The keyboard has adequate resistance and its response is smooth. The keys stay firmly in place without twisting or making unpleasant sounds. The keys are raised about 1mm. i If you can't decide which laptop to choose, our article How to Choose a Laptop may help you. Read about gaming, office, professional, stylish, touchscreen, VR-ready and basic laptops. We also offer accessories, including cases and bags. The white keyboard backlight is perfectly even. At night, it ensures easy readability without disruption or unpleasant brightness. The HP Envy 15 x360 doesn't allow keyboard backlight control. Good response times and well placed key make using the keyboard very comfortable and convenient, even if you're writing long texts. It allows you to type quickly and without typos. 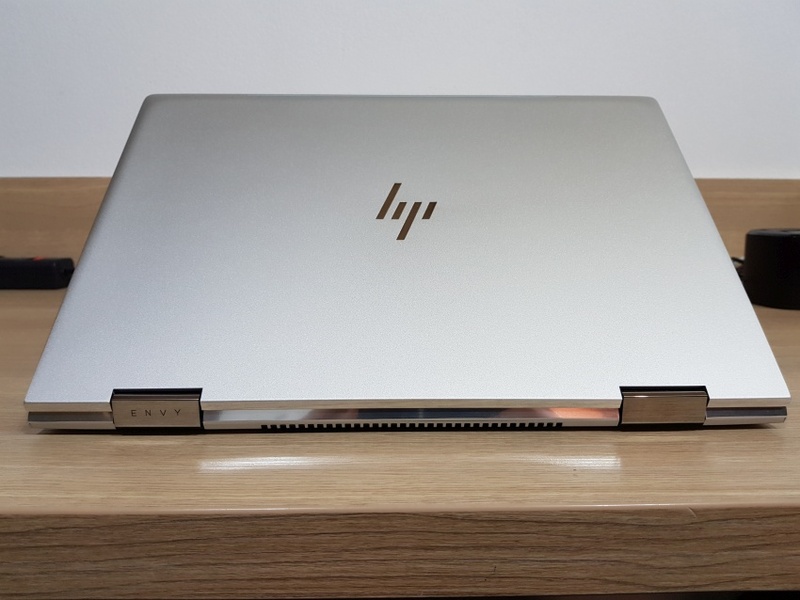 The HP Envy 15 x360's component and cooling system can be accessed via its base panel. The panel is secured with three TX5 screws in the front and four PH1 screws located under the rubber band in the back by the vent. After removing the base panel, the electronics inside are fully accessible. 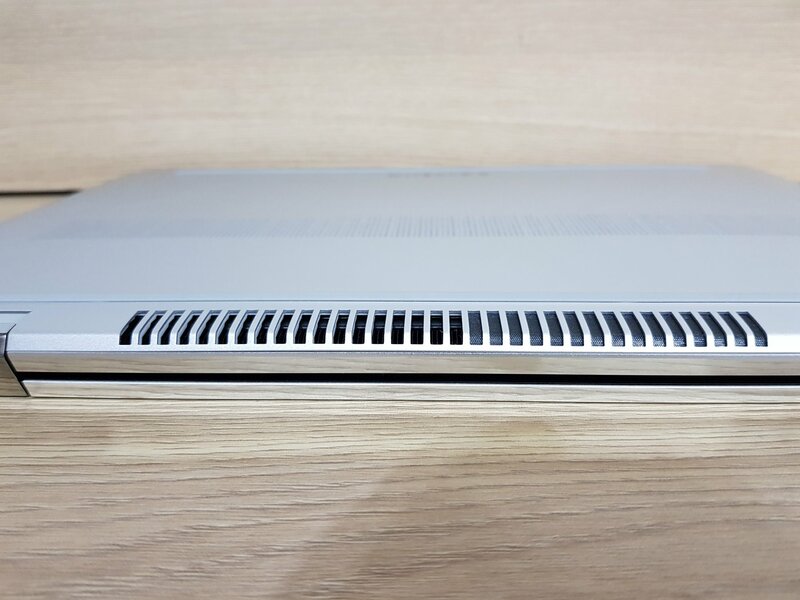 The HP Envy 15 x360's cooling system is quite unconventional. 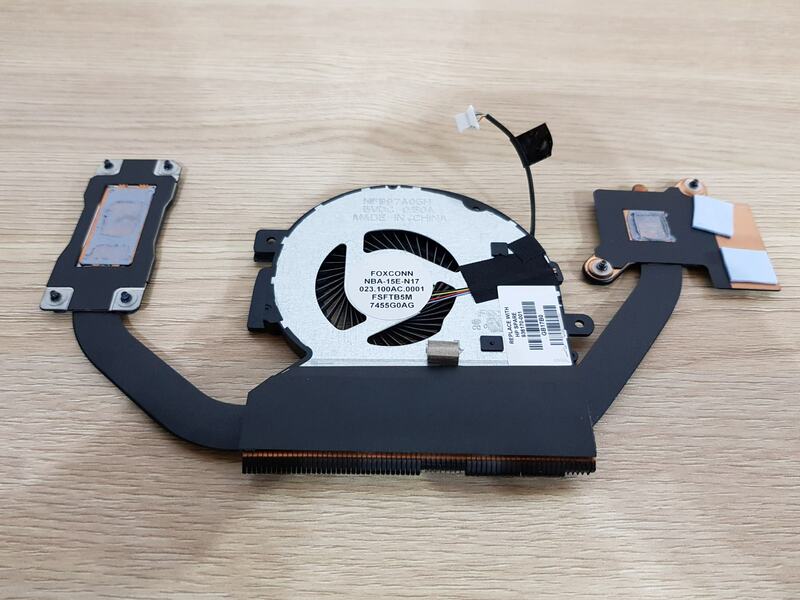 It features one copper heatpipe with a central cooler and a fan, as well as a contact base for the processor and graphics card. The fan comes equipped with fan regulation with PWM. It operates at 5V with the maximum current of 0.5A. The fan is made by Foxconn. After removing the cooling system, you can see the Intel Core i5-8250U processor on the left side. This quad-core Kaby Lake R processor with a 14nm architecture is clocked at 1.6GHz and reaches up to 3.4GHz with Intel Turbo Boost. It boasts 6MB Cache and HyperThreading feature. It includes the Intel UHD Graphics 620 graphics unit. The processor can work with 32GB RAM and its maximum TDP is 25W. Under the metal EMI cover, there is 8GB RAM DDR4 with a frequency of 2,400MHz. 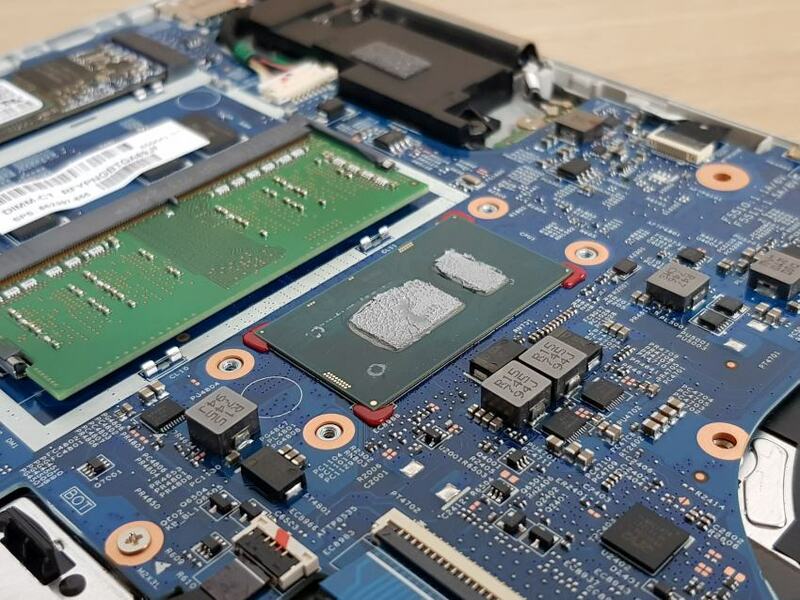 Half of its capacity is firmly soldered to the motherboard, while the remaining 4GB are installed in SO-DIMM, which can be used to expand RAM as needed. The tested memory is made by SK Hynix. On the other side, there is the NVIDIA GeForce MX150 graphics card with 4GB GDDR5 memory. The graphics card works at 1469MHz, but it can automatically increase its core clock to 1532MHz. It is made by Micron and offers a memory speed of 1502 MHz. Its maximum consumption is 30W. 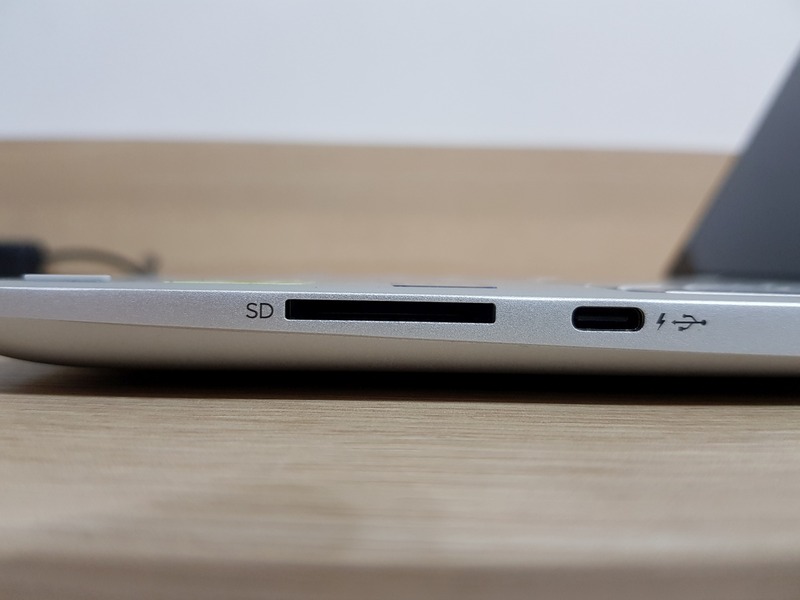 Next to the EMI cover, you'll find an M.2 slot, which allows you to install an SSD. The tested piece is equipped with the 256GB NVMe SSD Toshiba XG5. The SSD uses Toshiba 3D TLC NAND and reaches read speeds of up to 2700MB/s and write speeds of up to 1050MB/s. There is also a standard 1TB 2.5" SATA III HDD with 7200rpm — in this case it is the Seagate Barracuda. 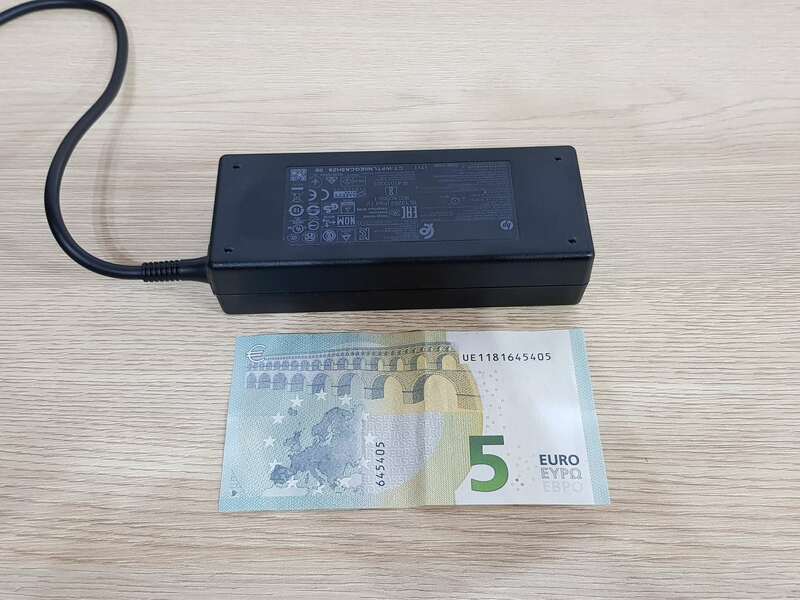 In the bottom right corner, there is the HP LK03XL battery, which consists of three Li-Ion cells and whose capacity is 55.325Wh. Given the size of the device, this capacity is average. However, if we take into consideration that the laptop comes equipped with a dedicated graphics chip and two hard drives, while maintaining a convenient weight and compact dimensions, there's nothing we can hold against its battery. After opening the device, however, we noticed two things that we didn't appreciate. Firstly, a screw that was supposed to secure the cooler was not screwed in properly. 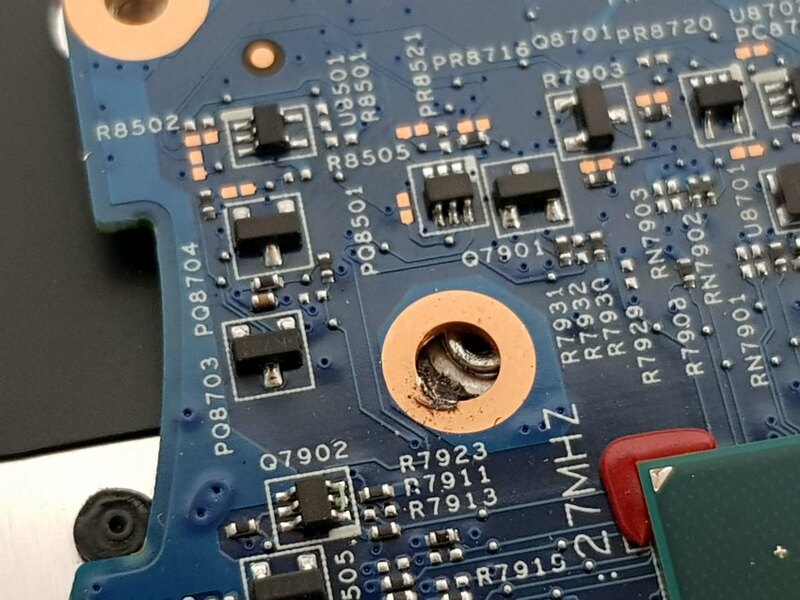 Secondly, there was a bit of hardened glue on the fan rotor, which might affect its balance. These issues are definitely an error committed in the process of the final product quality control because defects like these have no place in a device of such value. In defence of the manufacturer, we must admit that such flaws do occasionally appear in some tested pieces provided by different manufacturers. With the advent of the Kaby Lake R processors, the mainstream mobile i5 processors have gained two physical cores in comparison their predecessors. It means that together with Hyper-Threading, the processors offer eight threads that can work at 3.4GHz, while maintaining a power consumption below 15W. 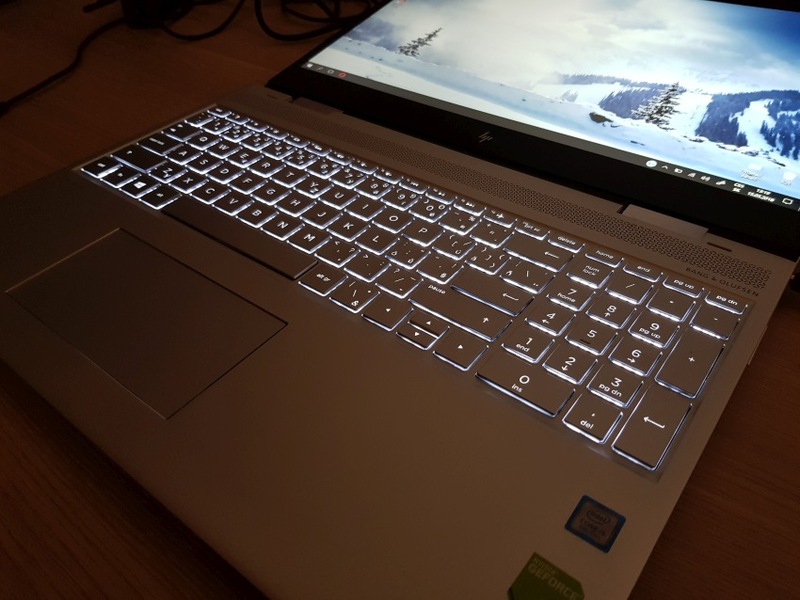 HP has combined this processor with a fast NVMe drive and the dedicated GeForce MX150 graphics chip. 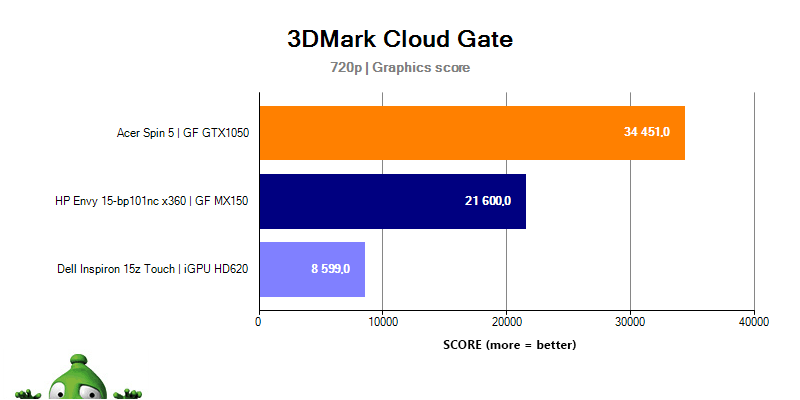 The performance of this graphics adapter is comparable with the performance of the GT1030 desktop graphics card and surpasses the older GTX 950M significantly. 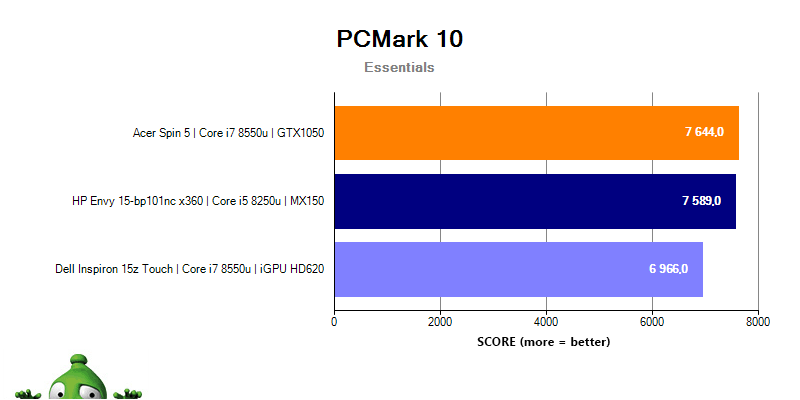 Are better days dawning on users who need every MHz of performance but refuse to carry around a heavy 4kg workstation? Let's take a look at the results. 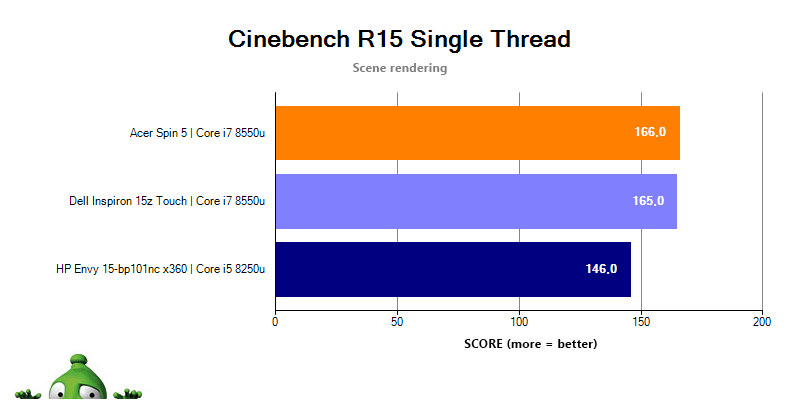 First, the processor performance was tested by Cinebench R15, which represents the CPU's rendering speed. 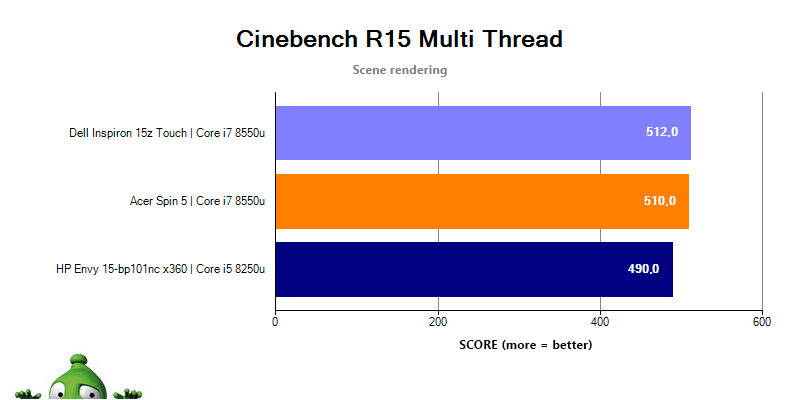 It tests the performance of a single thread as well as the processor's overall performance. 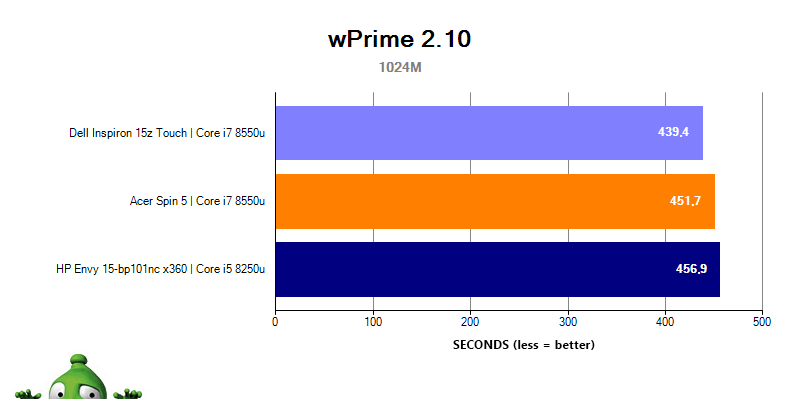 Next, the processor performance was tested by wPrime, which lets the CPU perform complex mathematical operations. 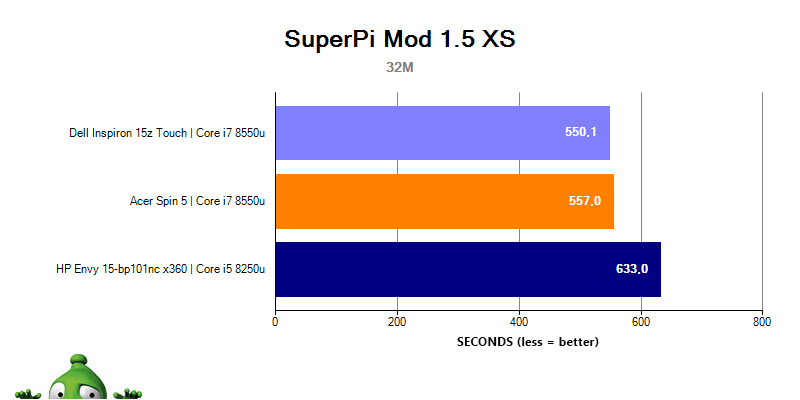 The last processor test was carried out using SuperPi, which uses the Gauss-Legendre algorithm to calculate Ludolph's number to a specified number of decimal places. During the isolated CPU tests, the maximum temperature reached 66°C. Cooling was quiet, yet audible, but never disturbing. 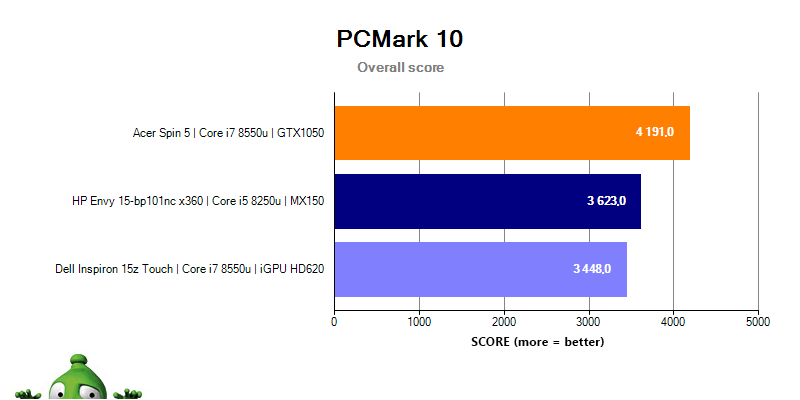 The laptop's overall performance that is significant for regular use was evaluated by PCMark 8 and 10. It is useful to compare the final score with a different system to get the idea of the performance difference. PCMark 10 distinguishes between the overall score and the individual score, while PCMark 8 judges Home Accelerated benchmark. To establish the speed and response times of the HDD, we used Anvil's Storage Utilities and Crystal Disk Mark. They test HDD performance in both operational and random sequences, access times and speed stability. The NVMe SSD Toshiba XG5's high read speeds enable smooth running without waiting for applications or games to load. The SSD boot time after restart was 12.5s. It was 6s after waking up from hybrid sleep mode (from the HP logo to the desktop). TLC NAND also play a role in write speeds, which is where the drive lags behind its competition. Therefore, it is not suitable for frequent writing of large files. We must praise the HDD for its performance and properties. It boasts excellent read and write speeds, steady performance and quiet operation without clicking sounds. The speed never fell below 170 MB/s — not even when large files were copied from the SSD to the HDD. Without any exaggeration, this is one of the fastest 2.5" SATA III drives. 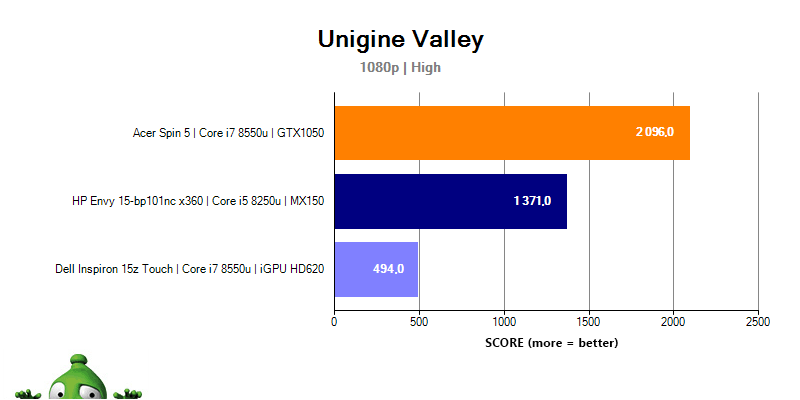 To be able to compare the performance of the GPU, we measured it in Unigine Valley 1080p set at High. It is an older test that is oriented on DX11. 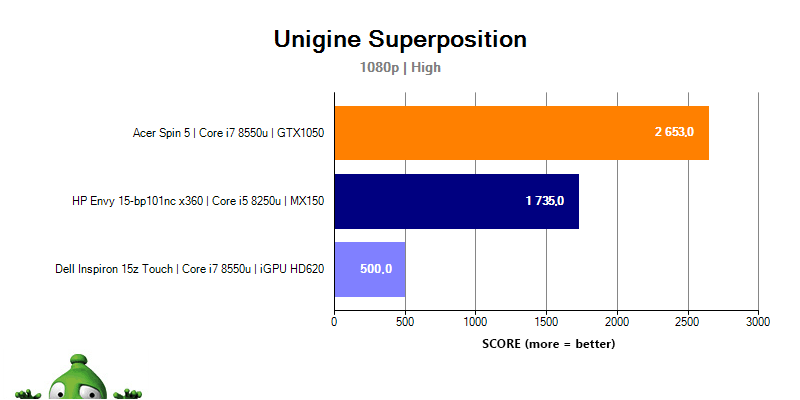 We continued with Unigine Superposition, which is a modern benchmark — and it was also set at 1080p High. 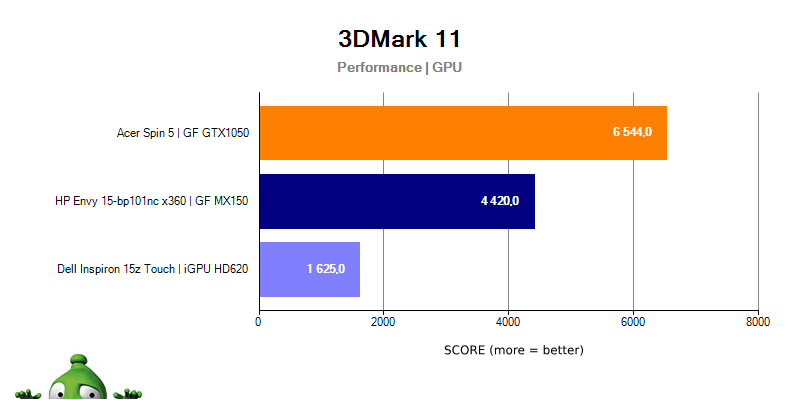 Another benchmark we chose for the tests is 3DMark 11. 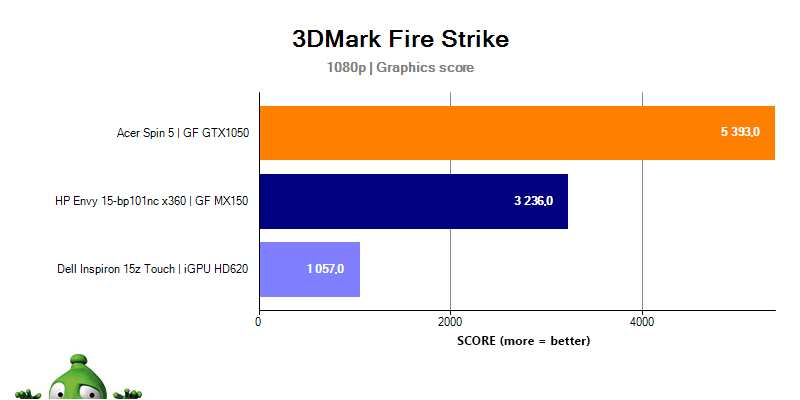 It tests Performance settings and evaluates the GPU's performance. 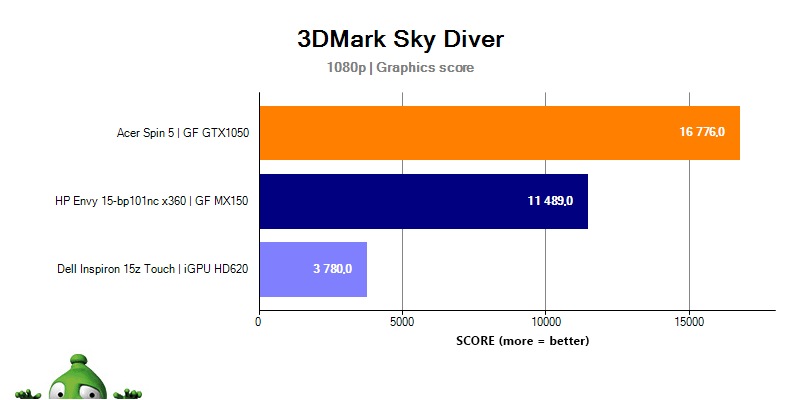 We used 3DMark to test Cloud Gate, Sky Diver, Fire Strike, and Time Spy, so that we could compare performance from DX10 up to DX12. The setting was standard. 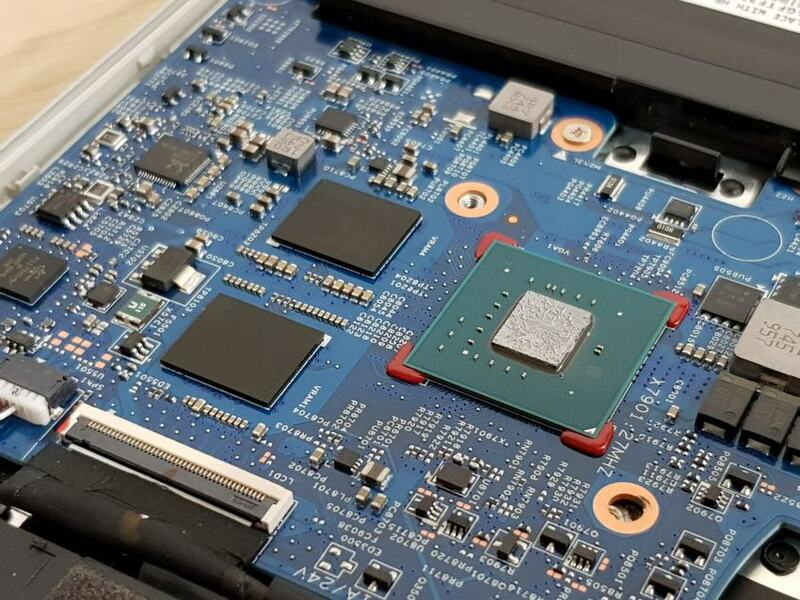 The MX150 graphics chip used in the HP Envy 15 x360 falls into the category of low-end graphics chips aimed at multimedia and graphic applications. However, it is ambitious when it comes to gaming and it's true that occasional gamers will appreciate its qualities. 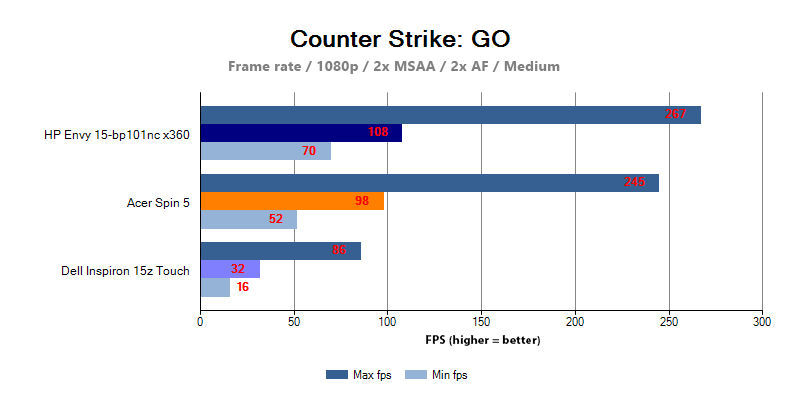 You can run popular multiplayer games such as Counter-Strike: Global Offensive or World of Tanks even in high settings. 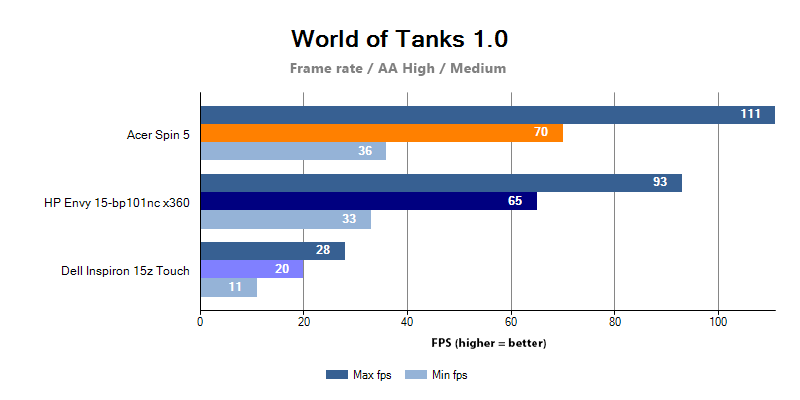 Nevertheless, you'll need to give up details and high resolution in more demanding and less optimised games. 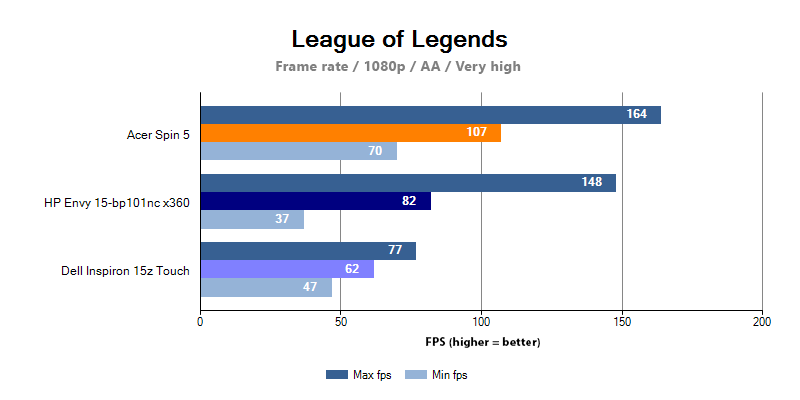 You can still enjoy most games in a native resolution of 1920 × 1080. 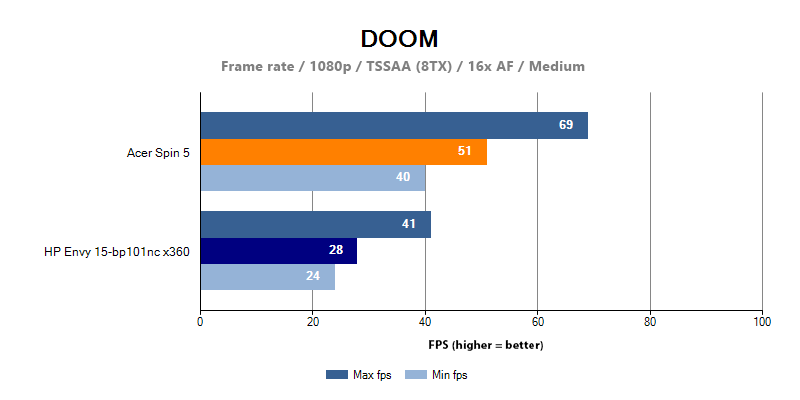 We tested a random selection of 4 consecutive maps to get a minimum, maximum, and average frame rate per second. Settings: native 1080p resolution, AA level "high", medium quality. We tested Summoner's Rift as Battle Training. Settings: native 1080p resolution, AA, Very High quality. The tested scene was in Dust II. Settings: 1080p resolution, 2x MSAA, 2x AF, detail setting = medium. The tested scene was the first gore nest in the opening map after the campaign launch. Settings: native 1080p resolution, TSSAA (8TX), 16xAF, detail setting = medium. Since the laptop has the ambition to offer multimedia entertainment, it installed premium stereo speakers by Bang & Olufsen, which are located under the decorative grille. HP doesn't include their output in the product information. The audio codec is produced by Realtek. 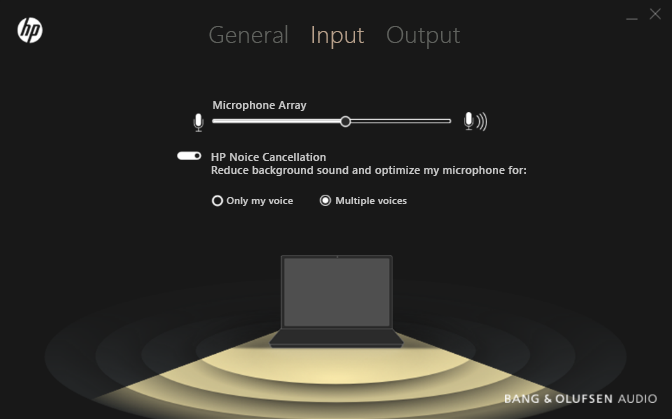 HP provided the laptop with HP Audio Switch software, which includes B&O Audio Control. 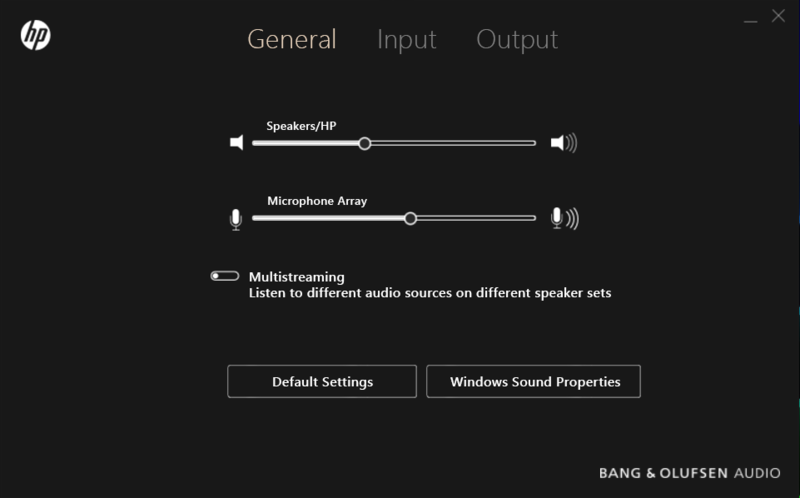 It offers some basic options for adjusting the laptop's speaker volume, sensitivity and microphone noise cancellation. It also provides a simple equaliser with output settings for music, movies, or voices. The software also enables you to manually adjust bass, treble and dialogue quality. 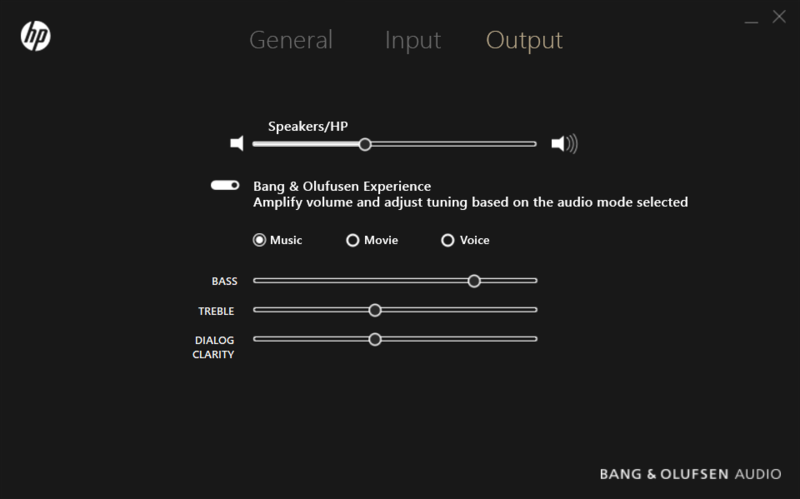 When Bang & Olufsen Experience is disabled, the sound seems artificial, dull, featureless and the speakers produce an echo. Disabling this option makes no sense. The laptop's speaker volume is sufficient, allowing you to enjoy watching movies in larger rooms without the need to use an external sound system. Sound effects in movies are noticeable, dialogues are clear and there are no crackling sounds even at maximum volume — we consider the viewing experience brilliant. We also tested the speakers by playing four tracks of different music styles. Treble is adequate, clear and precise, and so are mids. There is less bass, even with the highest setting. High-quality recordings allow you to hear separate instruments and the tones don't blend in. The speakers are the most suitable for modern and electronic music — the playback is very impressive given the size of the speakers. Jazz is also pleasant to listen to as the speakers handle the vocals beautifully. Game soundtracks and classical music suffer from the lack of bass, but the overall impression is good and agreeable. We noticed some drawbacks when listening to metal and rock music — fast guitar solos don't suit the speakers very well. Despite this issue and with regard to the speakers' size, laptop's class and its slim profile, we think these speakers are very good. 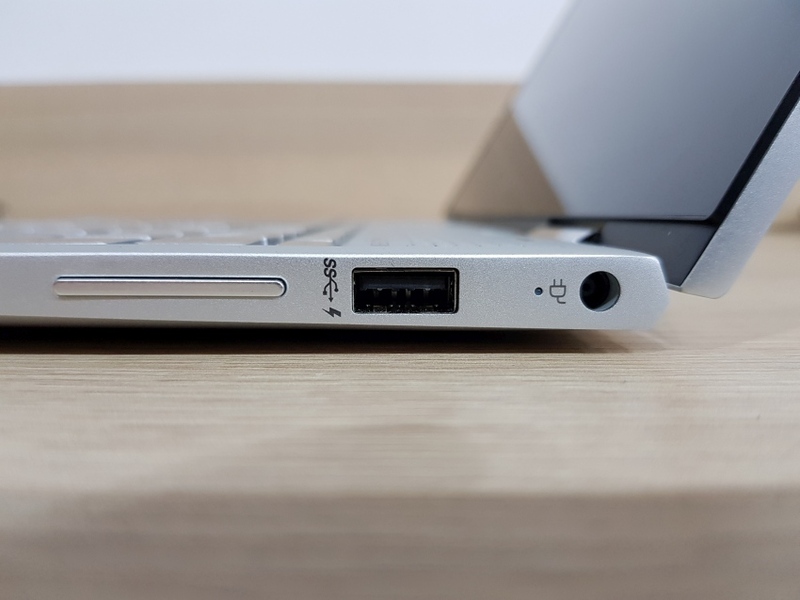 The HP Envy 15 boasts quality audio outputs. What surprised us even more than the speakers themselves was the quality of the 3.5mm jack. 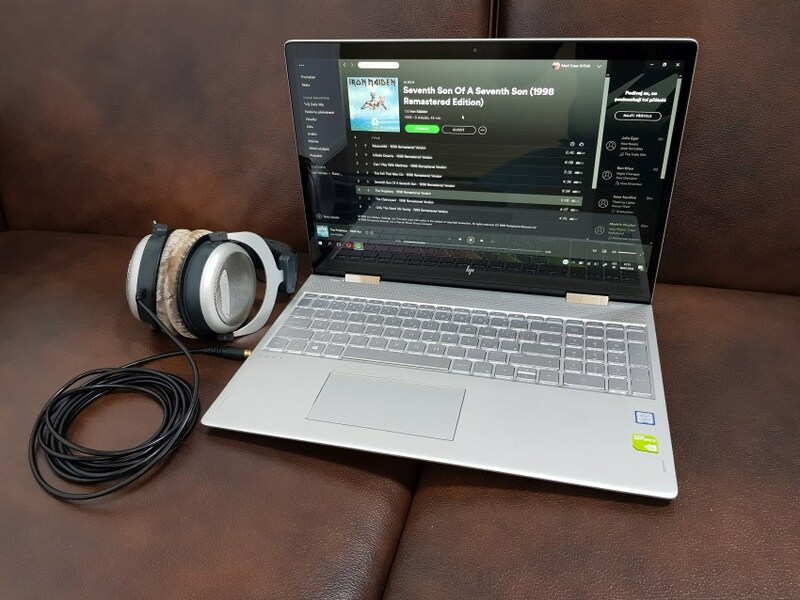 The laptop handled even demanding headphones, such as the Beyerdynamic DT880 250Ω — in terms of not only volume but also quality (with regard to the codec and other electronics). The tracks boasted outstanding instrument separation and energetic, hard bass. When the headphones are plugged in, the equalizer and all settings are deactivated to provide sound without distortion, which is very convenient. 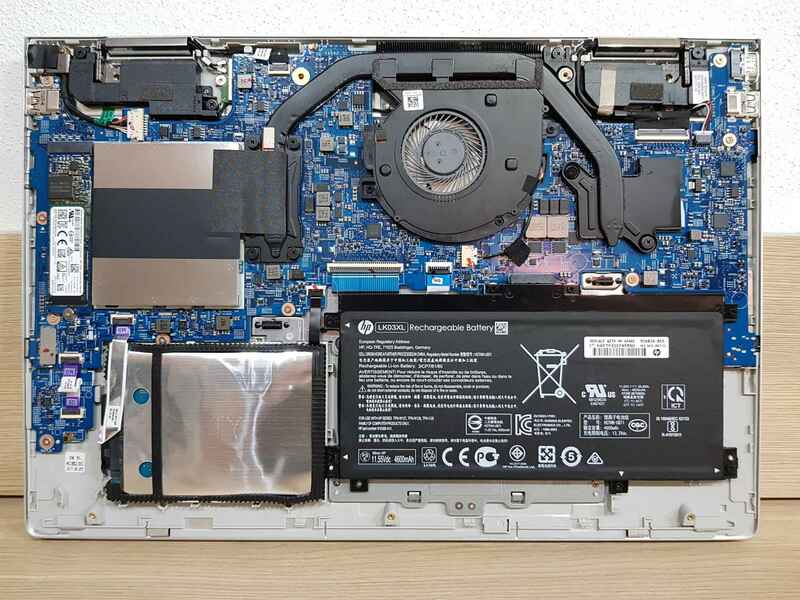 When it comes to sound quality, the laptop deserves a great ranking. The use of a low-voltage processor allows for quiet operation without overheating. The main source of heat in the system is the MX150 graphics chip with more than twice the power consumption of the processor. During regular OS tasks, such as browsing the web, watching videos, installing software or working with text, the CPU temperature averaged around 45°C with occasional peaks reaching 60°C. The cooling system remained quiet — the fan was spinning, but it did not emit any aerodynamic noise or noise generated by the bearing system. Such a system is better than passive cooling with intermittent running of the cooling fan. The only sound that could be heard was produced by the rotating hard drive disc, but given its 7200rpm and high transfer speeds, it ran quietly and without clicking. 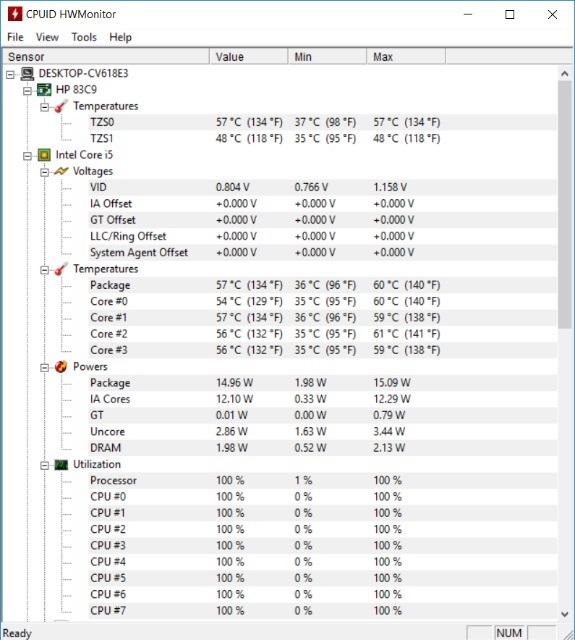 Under isolated CPU load, the maximum core temperatures reached 61°C. At that point, the cooling system was clearly audible, but it still wasn't distracting. The body of the device remains pleasantly cool on both sides, so you don't experience any discomfort when the laptop touches your skin. The maximum system load (CPU + GPU + RAM) gets the CPU to 83°C and the GPU to 63°C. The cooling system runs at max and the fan speed may become distracting after longer periods of time. 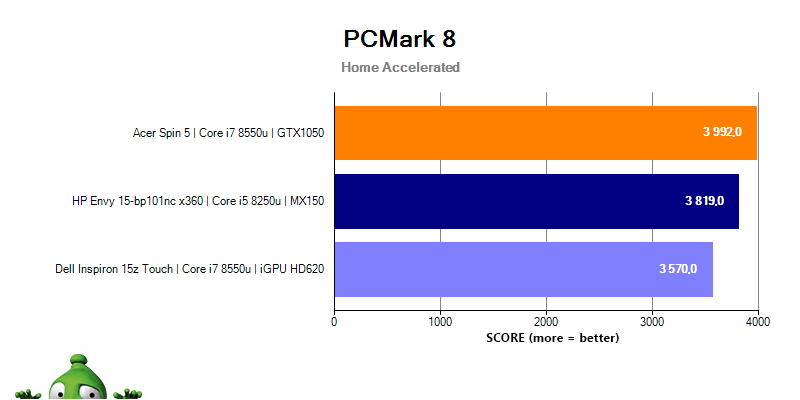 We should note that the MX150 graphics chip has a temperature limit — if it reaches 62°C, it will start to throttle. We experienced a frequency drop to 810MHz, which is nearly half of its normal value. It seems that the manufacturer has chosen to favour quiet cooling and pleasant temperatures over maximum graphics performance. We must say that we'd appreciate a software solution that would allow us to select modes ensuring maximum performance to the detriment of quietness and low temperatures when needed. There still are reserves in the cooling system. 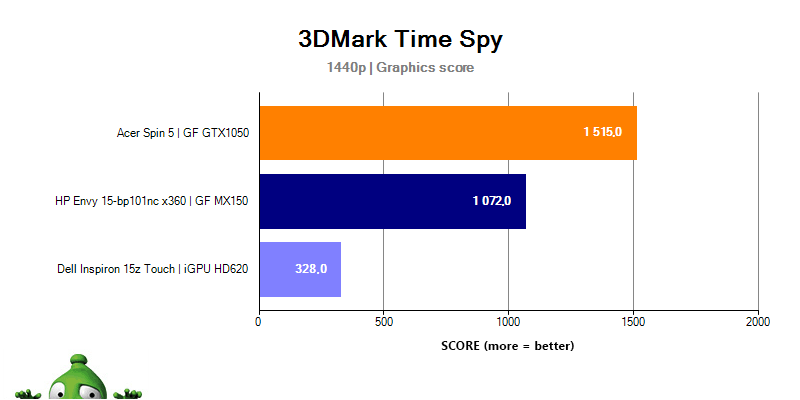 In its current state, the GPU maintains its standard clock for approximately 45 seconds, which is absolutely unsuitable for gaming. The test was conducted at room temperature (21°C), so hot summer months may bring worse results. The majority of other devices with the MX150 chip and a similar design throttle at 69°C. The battery life test consisted of several phases according to the type and intensity of the load. 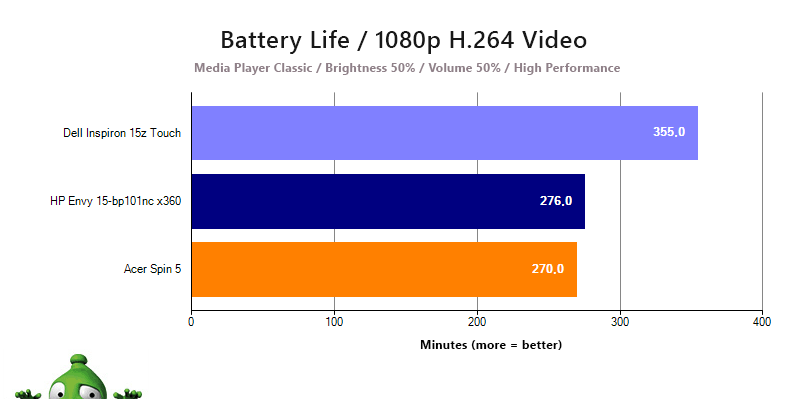 The most common load is 1080p H.264 video playback. The movie was played from an external USB 3.0 2.5" drive with WiFi turned on, the brightness level set at six, and the volume level was 50%. The laptop was in High Performance battery mode. 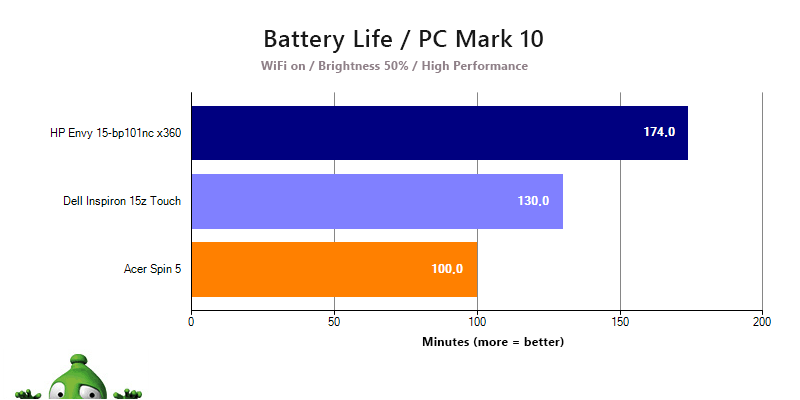 To test the battery life, we ran PCMark 10, which takes into consideration web browsing, videocalls, applications running on the laptop, video playback and more. WiFi was turned on, the brightness level was set at six, and the volume level was 50%. The laptop was in High Performance battery mode. 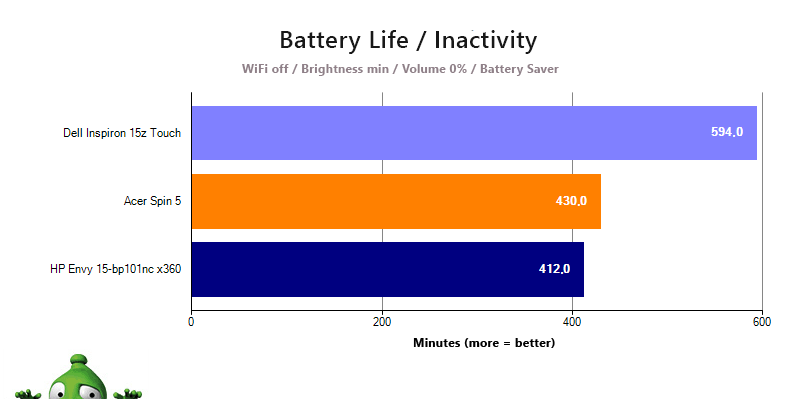 We also tested the laptop's battery life under maximum load. The screen brightness was set to a maximum. 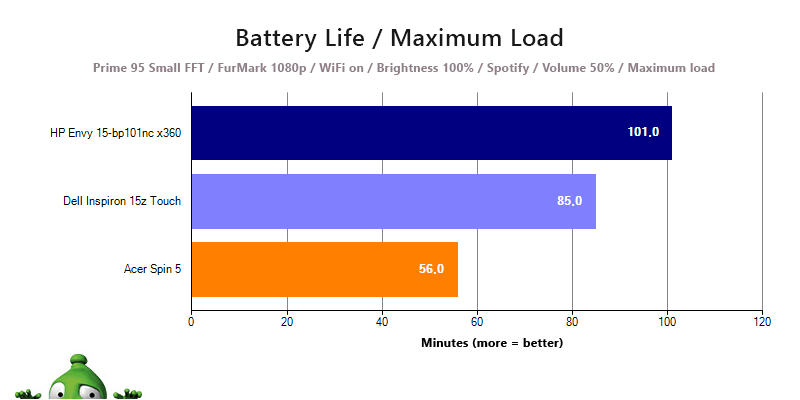 Both the processor and the graphics chip were running at 100%, Spotify software was used to play music in the background, and the speaker volume level was 50%. The laptop was in High Performance battery mode. The last test focused on the battery life when the laptop is inactive. WiFi was turned off and the brightness level was at a minimum. The speakers were turned down and the screen was showing the desktop area without any hard drive or other activity running in the background. The laptop was in Battery Saver mode. 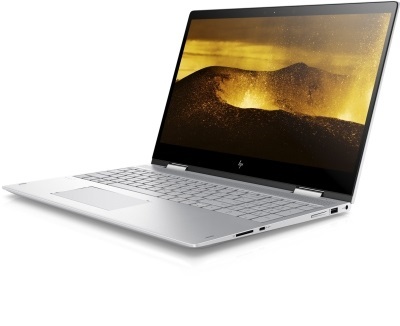 The HP Envy 15-bp101nc x360 has proven to be a compact and powerful everyday companion that meets users' expectations. It is a good, well-rounded device that we can highly recommend to everybody who is looking for a 15" tablet PC. It boasts a beautiful design, solid construction and dazzling display, and offers a first-class audio experience. The laptop has its shortcomings, but apart from a manufacturing defect that we found in the tested device, all its flaws can be easily fine-tuned with a few finishing touches or eliminated with a new driver or BIOS update in the future. If it wasn't for these shortcomings, the HP Envy 15-bp101nc x360 could be considered a flawless multimedia device.